The Bezos backlash: Is 'big philanthropy' a charade? Image caption Amazon owner Jeff Bezos has been criticised by President Trump for paying "little or no taxes"
"Great fortunes," the American industrialist Andrew Carnegie is reported to have said, "are great blessings to a community." No doubt the beneficiaries of multibillionaire Jeff Bezos's new philanthropic fund will agree. But far from being universally applauded, the Amazon founder's pledge was met with fierce criticism. James Bloodworth, a writer who went undercover to expose working conditions at the company's fulfilment centres, said there was "something slightly ironic" about Mr Bezos's plan. "There have been credible reports of Amazon warehouse workers sleeping outside in tents because they can't afford to rent homes on the wages paid to them by the company," he told the BBC. "Jeff Bezos can tout himself as a great philanthropist, yet it will not absolve him of responsibility if Amazon workers continue to be afraid to take toilet breaks and days off sick because they fear disciplinary action at work." Accusations of hypocrisy flooded in on social media, with many pointing to Amazon's efforts to reduce its tax bill in the US and abroad. Others highlighted Amazon's recent successful attempt to quash a law in Seattle - the home of the online retailer's headquarters - that was designed to raise millions of dollars to alleviate the city's homelessness crisis. "We'll use the same set of principles that have driven Amazon," he said in the statement announcing his fund. "Most important among those will be genuine, intense customer obsession. "The child will be the customer." The magnate - himself once the world's richest man - outlined what he saw as the moral duty of the super rich: "To consider all surplus revenues which come to him simply as trust funds, which he is called upon to administer." "The man of wealth thus becoming the sole agent and trustee for his poorer brethren," he wrote, "bringing to their service his superior wisdom, experience, and ability to administer - doing for them better than they would or could do for themselves." His doctrine became the model for donations by fellow tycoons, including John D Rockefeller, who saw no conflict between their approach to business - in which they built monopolies and crushed labour unions - and their philanthropic work. It is a model that laid the path for the modern-day benefactions of Bill Gates, Warren Buffett and Mark Zuckerberg - whose charitable causes are distinct from the way they run their companies. At this year's annual meeting of his firm Berkshire Hathaway, Mr Buffett could not have been clearer. "I do not believe in imposing my political opinions on the activities of our businesses," he told assembled shareholders, when quizzed on whether he would divest from gun manufacturers. But according to Anand Giridharadas, Mr Carnegie's approach helped give rise to mass inequality. Mr Giridharadas, whose book Winners Take All tackles the so-called "charade" of modern philanthropy, characterises Carnegie's approach as "extreme taking followed by extreme giving". The super rich, he argues, stop short of "transforming the system atop which they stand". While Mr Bezos's donation is admirable, he says, it does not tackle the "deep and complex root causes" of homelessness and poverty in the US - which include Amazon itself, as the firm has been a beneficiary of the new world of precarious employment. A good motto for the likes of Mr Bezos, he suggests, would be: "Ask not what you can do for your country, ask what you have already done to your country." "If you want to wade into public policy, you have a moral responsibility not to put a Band-Aid on cancer," he says, adding that Mr Bezos could work to influence policy instead. One way in which he could do so is by fighting for a change in the law when it comes to companies' responsibilities to shareholders, and the bottom line - paving the way for corporate structures which sacrifice some profits in pursuit of social good. "Quite frankly Bezos's greatest act of philanthropy is Amazon itself," he argues. "Lower prices, more choice and competition have delivered billions for Bezos and billions worth for the hundreds of millions of customers he serves." What's more, Mr Kilcoyne dismisses any talk of the super rich's moral responsibility to give in a certain way. 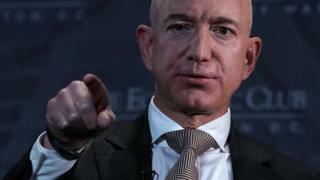 "Jeff Bezos has a right to spend his own money as he pleases. "Armchair commentators might like to say that they know better than Bezos what he should spend his money on, but they'd do better to try and convince him of their philanthropic cause than chastise him for his choice."